The latest installment of Big Idea's popular children's animated series "3-2-1 Penguins!" hits Christian retail stores at the weekend. Featuring three new episodes, 3-2-1 Penguins! 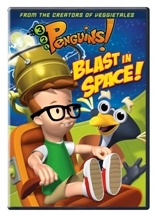 : Blast in Space! releases Saturday, Feb. 28, at Christian bookstores, three days ahead of the general market. Teaching children lessons from the book of Proverbs about patience, diligence and compassion, the lovable space cadets Zidgel, Midgel, Fidgel and Kevin as well as brother and sister Jason and Michelle face giant ants, dancing tikis and a volcano on the verge of eruption. The 66-minute DVD, which features commentary, preview and how-to-draw segments, will be distributed in the Christian retail market through Word Distribution. The "3-2-1 Penguins!" series has sold 1.5 million videos to date, Big Idea officials said.